How did a group of Soviet Pentecostals end up living in the U.S. embassy? 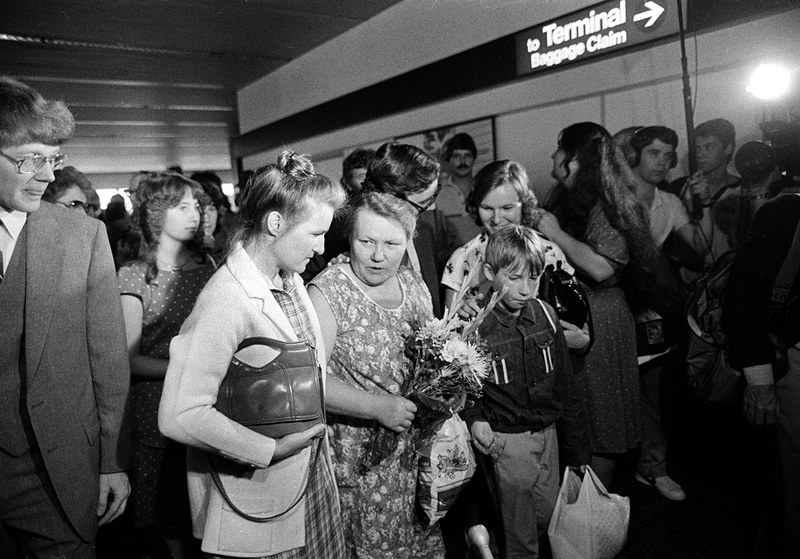 Augustina Vashchenko, center, walks with members of her family arriving at the Seattle, Wa., airport on July 30, 1983, after they received a permission to emigrate from the USSR the previous month. Persecuted by the Soviet authorities, seven followers of the Pentecostal sect tried to emigrate to the United States from the 1960s onward. But Washington did not want to row with Moscow because of them, so the would-be emigres finally had to stage a hunger strike in the U.S. embassy. "I want you to know of my deep personal concern for your health and your lives, which now are placed in extreme jeopardy by the hunger strike you have undertaken… [We urge] you to abandon this course," wrote U.S. President Ronald Reagan to the U.S. embassy in Moscow in 1982. By that time, the Siberian Seven – a group of Soviet Pentecostals who demanded the right to leave the Soviet Union – had been living in the embassy's basement for three years. The fate of all believers in the USSR was unenviable. But while the authorities grew comparatively tolerant of authentic Orthodox Christians after World War II, they continued to jail and exile the followers of sects, especially of foreign origin. In this situation, Pentecostals – who belonged to effectively a Western Protestant sect – were particularly easy prey. Their noisy meetings, where people enter a trance, speak non-existent languages and constantly anticipate the end of the world (they believe that the Holy Spirit may descend on anyone and they will then be able to speak all languages and treat people with the laying-on of hands), represented something quite intolerable in Soviet society. Pentecostalism was brought to Russia by Scandinavian missionaries in the early 20th century, however, the first major wave of this type of evangelists came with 2,000 soldiers who returned from German captivity after World War I. These 2,000 included Pavel Vashchenko, who was the first in his family to convert to Pentecostalism. From the 1930s to the 1960s, the Vashchenko family lived in Siberia, experiencing constant pressure from the authorities. Pentecostals were repeatedly fined, and their meetings were dispersed. The Vashchenko clan stood out by its fanaticism even among fellow believers: They would not let their children go to school. The early 1960s saw the beginning of another anti-religious campaign – movie theaters showed films like Leaded Sky over Borsk (1961), where Pentecostals were shown as bloody fanatics, and the Soviet authorities began to arrest them again. In 1962, the Vashchenkos decided that enough was enough and applied to the U.S. embassy for political asylum. They, however, were not invited to the United States, but received prison terms in the USSR for this instead. In 1963, brothers Pyotr and Khariton Vashchenko were sentenced to two and five years in prison, respectively. In 1968, the reunited family once again tried their luck at the U.S. embassy with the same result. The Americans kicked out the Vashchenkos, who broke through into the embassy. Pyotr was placed into a mental institution for a month and a half, while his wife Avgustina was sent to a prison colony for three years. Their next attempt to emigrate was to place only 10 years later. "Today, Christians have become shallow, but earlier they were ready to die for the faith," Lyudmila Vashchenko, a relative of one of the participants in those events, who still serves as the pastor of a Pentecostal church in Siberia, said about the events of 1978 in an interview with RBTH. Then their family received an invitation to the U.S. from a Protestant pastor from Alabama. There were seven who found the courage to go to the embassy again. Pyotr, Avgustina, Lydia, Lyubov and Liliya Vashchenko were joined by their neighbors, Timofei and Maria Chmykhalov. "They got in by some miracle; one stayed outside to distract the guard, while the others slipped into the embassy," said Lyudmila. At that point, their luck ran out. The Pentecostals' only success that time was that they were not shown the door. They took advantage of this and began living in the corridors. Apart from fanaticism, the Vashchenkos were held by their exaggerated fear. Decades later, Avgustina Vashchenko claimed: "We would have been immediately hanged." In fact, no one was hanged in the post-Stalin Soviet Union, and only three women were shot in the course of 40 years: a serial killer, a military criminal and a large speculator. Two months later, the “Siberian Seven” (how these two families were labeled in the U.S.) were allocated a room in the basement of the embassy. They stayed there for five years – seven people in a close little room with two beds. They wrote letters to the Pope, prayed, quarreled and went on 15-minute daily walks. The Americans fed the fugitives, but were not in a hurry to help them emigrate. Lev Simkin wrote that the ambassador first visited the fugitives only after a year of their voluntary confinement. In late 1981, Augustine and Lydia refused to eat. Lydia, who was exhausted by the hunger strike, was taken to hospital, and the uproar forced both the U.S. and the USSR to act. Ronald Reagan wrote to the Vashchenkos, asking them to abandon their hunger strike. The Vashchenkos were on hunger strike "to protest what they regarded as American failure to enable them to emigrate," the New York Times wrote on Feb. 3, 1982. In 1983, Lydia was granted an exit visa. The remaining members of the Siberian Seven flew to the United States later that year. Once there, they took up jobs as cleaners, workers, an accountant and a teacher. Today, the Russian authorities do not exile or imprison Pentecostals, but still do not favor them. The Russian Orthodox Church cooperates with them on charity issues, but considers them to be a sect, not a church.However, despite this, the number of Pentecostals in Russia is growing. According to religious researcher Roman Lunkin, even though the authorities made it more difficult for non-Orthodox communities to register in the 2000s, the number of Protestants in Russia has increased to three million, most of whom are Pentecostals.